OLPC News is the combined efforts of talented writers, commenters and contributors all focused on the One Laptop Per Child program and its impact on technology and education in the developing world. Profiles of the main contributors are listed in the posts below. New contributors are invited to email a starter post and being the conversation. For these professional geeks who have unchecked tech-lust and a deep experience and love for the developing world, One Laptop Per Child brings both awe in the audacity of its goal, a laptop in the hands of every child, as well as a healthy skepticism that it will achieve that goal. OLPC News is not associated with the One Laptop Per Child organization or any of its participants. In addition, the opinions of contributors or commenters expressed here are theirs respectively and do not represent the views or opinions of their employers. 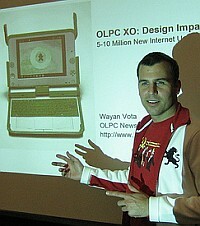 OLPC News is published by Wayan Vota, who creates and deploys international development programs that use information and communication technologies to promote economic prosperity and stability. Wayan celebrates the ability of One Laptop Per Child to bring technology to the forefront of economic development, and can't wait to have a OLPC XO himself, but he fears the lack of a defined implementation strategy and realistic cost estimates will create great waste and disillusionment with technology. Using machine translation produces incredibly poor results for marketing content. Translations of this site are utterly unusable in Russian and Japanese.